So, historically, I’ve been posting a black and white B&B paper doll and then a full color version the next day. I’ve decided that this technique is not time saving in any real way, unlike my spacing of my Marisole Monday & Friends paper dolls a week apart which saves me so many headaches, so I am going to start posting both and black and white version of the Buxom and Bodacious printable paper doll and the full color version on the same day. I hope no one minds this change, but I don’t think anyone will. Anyway, to say something intelligent about the paper doll… I actually haven’t got much intelligent to say about the paper doll. This is one of those paper dolls the languished on my computer hard drive for weeks. I thought about working on it, got distracted and then moved on and eventually realized (like on Sunday) that all I really needed to do was layout and file formatting. So, feeling a little foolish I finished her up and here she is. I confess to not being completely pleased with her color scheme. 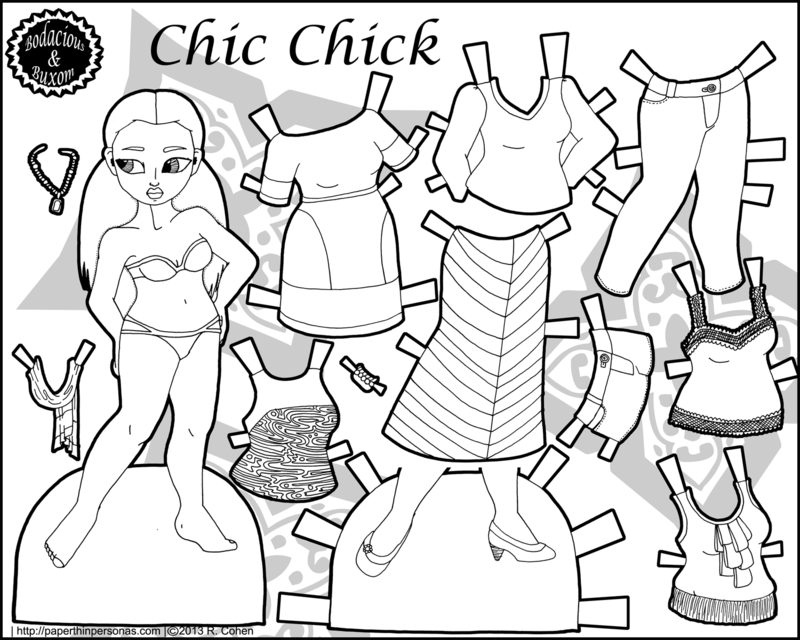 It feels a little sedate for my usual taste, but not every color scheme is a winner and that’s why the paper doll has a black and white option for coloring yourself. I always think about commenting on your posts and then … don’t, but your comment about everyone needing encouragement hit me today. I have printed out a TON of your paper dolls and love them to bits and am very grateful you create them, so thank you! In regards to this set – I really like the dress and the skirt! Thank you, Kat. I’m glad you like the paper dolls. Generally, I get anywhere from 200 to 400 unique views per post and average about 2 to 3 comments- so less than 1 percent of my readers comment. It doesn’t bother me too much, because I have other ways of tracking stats, but I worry about new paper doll bloggers who don’t get any comments and I fear they might get discouraged and give up. I don’t want to see that happen to them, so I try to encourage people to comment. i kind of prefer it this way where you can see the two side-by-side right away! love the purple and teal ~ and her long hair! All the hair on the B&B dolls has been kinda insane. I’m having fun with over the top hair. Also, what does Buxom and Bodacious mean? Buxom is an sorta old fashioned term for a “healthy plump” women, usually one with large breasts. It dates from the Middle English. Bodacious came from the combination of “bold” and “audacious” and shows up in the English language around 1832. At least, that’s true according to Websters Dictionary. I actually really like the color scheme. The teal and purple work together quite nicely. And that sequined-tyedye-colorful top? WANT. I had fun coloring her. I generally try to forget what you’ve used for colors, but I ended up fairly heavily purple too.